Do we as a nation now fear the truth so much that we prefer deception and lies? Correspondent Harun I. recently wrote about the necessity in a democracy for an open and honest discussion of the sacrifices and trade-offs which must be made. I found his comments deeply disturbing because they clarified my sense that our government's policies are fundamentally based on the opposite of open honesty. 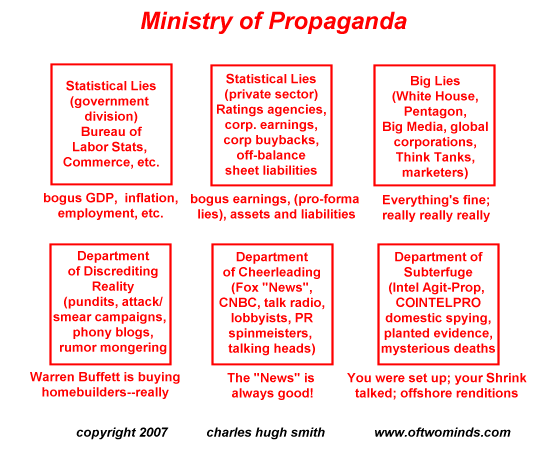 Virtually every policy with any fiscal or financial consequence is shrouded in lies, deception, obfuscation, disinformation and propaganda. Yes, there is outrage in some quarters, and this is a positive sign. Even more positive is the growing demands for transparency and an honest accounting of our government's (and the Federal Reserve's) backstops, guarantees, actions and obligations. I see plentiful evidence that honesty is extremely threatening to the status quo. The Federal Reserve is in a full-blown panic that its machinations might be revealed to the public it claims to "serve." Here in California, a newspaper had to go to court and sue the local governments to release the salaries and total compensation of public union employees. Why would the unions and their employers be so terrified of transparency, of actually allowing the taxpayers who pay their salaries a glimpse of where their money is going? We all know the answer: because the public would be outraged to see the $200K salaries and double-dipping, the fat "consultant fees" paid the day after the employee retired, and on and on and on. The Fed is terrified of transparency for the exact same reason: that the citizenry will be outraged by the squandering of trillions of dollars, the machinations to protect the wealthy few at the expense of the many, and perhaps most damning of all, the utter failure of the Fed's manipulations, prevarications and obfuscations. The average American does not want to hear the "diagnosis" that Medicare and Medicaid are doomed to insolvency in a few short years, as is their entire government. They prefer soothing lies that nothing need be done except borrow another $2 trillion a year from now until Doomsday, which is but a few short years away. The truth is that Medicare is doomed and we shall not get the lavish care "promised" by our government. What year this becomes apparent I cannot say; it might be 2012, 2014 or 2019. Regardless, that year will come, and sooner than most think possible. The great sad irony is the fearful patient who refuses to even go to the doctor expires not from the cancer but from their unwillingness to get the truth early on and have an open, honest discussion about treatment options. I am saddened by the prospect that this describes our nation at a fundamental level. For it is insecurity and a total lack of confidence and faith that drives people to choose denial and magical thinking over truth, honesty and an open dialog. If one is confident that one can restore one's health, then the diagnosis, no matter how terrible, is welcomed so the treatment can begin immediately. 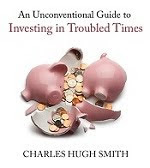 Thus the current preference for lies, deception, propaganda, magical thinking and denial is deeply troubling, for it suggests America has lost its faith and confidence that it can solve its pressing financial/fiscal problems. I preface Harun's comments by noting that he served his country at the tip of the spear (U.S. Armed Forces) for many many years, serving in harm's way at the behest of this nation's civilian leadership, deploying in some of the most sensitive circumstances with some of the nation's most advanced technologies. Thus his words carry great weight, at least to me. Civilization is a tenuous social arrangement at best. People bandy about the word "rights" as if it is some universal principle like physics. Any warrior would tell you that, outside of civilization, one only has a right to what he is strong enough to take and hold. A right is defined as a moral or legal obligation. Quaint. I read comments posted on a blog that everyone has a "right" to the basics and that we should work to establish a "Star Trek" world. Well to all the socialists out there I offer that Nature did not get that memo. Nature mocks "rights" with famine, plague, pestilence and floods, and all such natural events harmful to our existence. It mocks "rights" by giving us limited resources. Katrina showed us vividly what happens to "rights" when resources are scarce and survival is threatened. Socialists even mock rights. If I own myself then it would follow that my labor and the fruit of it is my own property. But they would insist that others have a moral and legal obligation to my property (fruits of my labor) and therefore to me. Without consent, I would say that this defines the term slave. While it may be immoral to watch someone starve when it can be prevented it is equally immoral to enslave someone (deprive them of their freedom) to prevent it. That Obama wants to raise taxes on the wealthy because "they can afford it" is not the point. The point is freedom. The canon of this country holds that my body and mind belong to me and not the state. Since the labor (expenditure of energy physically or intellectually) of an individual and its fruits cannot be separated, socialism creates a state of slavery. Whether this arrangement is acceptable to a society is another matter but according to the body of law for our country, it is not freedom. 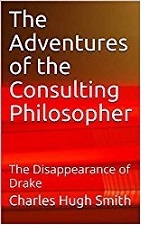 If words are to have meaning and through logic convey truth then we must follow in the footsteps of Socrates and Plato and take the journey that leads to truth, however unpleasant. We must look at our words as we use them to define our beliefs. This is not about good and bad. If the truth is a thing we can all agree on (sure, I will work twice as hard to give up part of my pay to help a struggling family) then great. It is when we are not in agreement and graft and deception are used under the guise of law that problems arise. In South America there is a tribe that has an interesting concept. They are hunters. If you are successful, no problem. If you are unsuccessful either you starve or a successful hunter provides for your family. In doing so he gets to share in everything you have -- even your wife. Some would think this barbaric, I think it is one heck of an incentive to be a successful hunter! Regardless, it is unambiguous and agreed upon in that society. Traders I know are some of the greatest philanthropists, giving away millions every year to charities on top of paying taxes. A couple of my friends do not deduct these contributions on their taxes. No one forces them. That is freedom. There is no perfect society. Solving the problems of poverty in an industrial or post-industrial society is no trivial matter. What does one do when there is no work to be had and no land readily available upon which a man can grow his own food and livestock to provide for the basics for himself and his family? I do not have that answer but I do know that we should have an open and honest discussion and come to an agreement (what assistance will be given and how it will be funded). (Emphasis added: CHS) Dissembling and stealing, running up debts that can never be repaid and enslaving under the guise of law and sending the country lurching toward economic ruin are exactly what we should not do. We are entering an age where we will have to deal with facts instead of ignoring them. We can no longer afford to exist and function at low psychological levels associated with limbic responses. We can no longer afford a government that believes lies are necessary to maintain order. (Emphasis added: CHS) In the times to come we must know that it is in our best interest to do what is right and just despite our fear. And if one does not know what that means, go talk to a Vet whose buddy threw himself on a grenade to save his friends. Thank you, Harun. What we know about our government's responses to this entirely predictable financial meltdown is that truth and honesty are nowhere in sight. The government's top financial officers lied to Congress that the nation would implode if they didn't give extraordinary powers and extraordinary sums of money to Treasury officials working behind cloaks of secrecy and deception. A year later, the deceits, disinformation, half-truths, statistical conjuring and behind-the-scenes manipulations continue apace, with catastrophic results. The Treasury sells debt to the Fed which buys the debt with money created out of thin air, and we are told there is great demand for our new debt. Yes, the world is delighted to lend us $2 trillion a year, or perhaps it will be $3 trillion soon, or perhaps $10 trillion. There is no limit on the largesse--or on the lies. 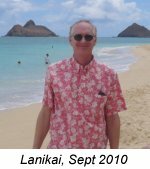 Permanent link: When Honesty Becomes "Threatening"
I've been invited to join the writers contributing to Seeking Alpha. You can also find my work on AOL's Daily Finance. Thank you, Justin L. ($15), for your much-appreciated generous donation from Oz to this site. I am greatly honored by your support and readership. Inflation is not a given, and neither are stable commodity prices. Correspondent Angry Saver noted that deflation /price stability has occurred on a regular basis. Indeed, according to The Great Wave: Price Revolutions and the Rhythm of History , prices in 19th century Great Britain hardly varied. A loaf of bread fetched the same price in 1803 and 1893. Inflation is immoral. The notion that deflation will bring eCONomic ruin is a ruse to justify theft. Economies can function fine with deflation, although with all our ponzi debt it would be very painful now. It's kleptocracies and ponzi finance that don't fare so well under deflation. A few "random" points of reference. From 1871 through 1900, annualized CPI inflation was negative 1.56%. From 1871 until 1934, annualized CPI inflation was +0.09% (and this period included a substantial inflation centered around WW1). 1934 is significant as this is when the U.S. confiscated gold from its citizens. From 1934 through 1971, annualized CPI inflation was 3.04% (welcome to the nanny state). 1971 is significant as this is when Nixon officially abandoned the gold standard. I say "officially" as the tether had long since been broken its just that the market ignored this reality. From 1971 to 1983, annualized CPI inflation was 7.78% (welcome to inflation driven exponential debt growth)! 1983 is critically important although few realize its significance. What's so special about 1983? Well, that's the year we started phasing out actual house price increases from CPI and incorporating Owner's Equivalent Rent (OER). And OER was implemented under Volcker, an alleged inflation fighter (there are no good central bankers, although some are clearly worse than others). What's important to keep in mind is that inflation volatility is a financial killer. Annualized CPI inflation from 1871 to the present has only been 2.08%, yet many have been devastated by its theft (WWI, WW2, 1970s). And to add insult to injury, our official policy of inflation (and the spectre of high inflation) drives people towards Wall St. (risk) and their venomous investments which all but guarantee losses in real terms for the majority. It's hard for me to accept that an eCONomic policy based on theft and volatility will lead to the best outcome. Bernanke is sure though. Just like he was sure that a light regulatory touch would lead to the best outcome. Just like he was sure that there was no housing bubble to go bust. How much pain will we be forced to endure before Bernanke admits that more debt IS the problem? Since inflation, consumer and commodity prices all share the same space in the public awareness, let's turn to correspondent B.C. for some charts of the CPI (consumer price index) and commodities. Here is a chart of the new CRB index 2001-2009. Is it just coincidence that this peaked along with the global housing bubble in 2006? The second spike in 2008 reflects the rise of oil to $149/barrel. Next: here is B.C. 's annotated chart of the CPI from 1974-2009. This is a content-rich chart so click on the thumbnail to see the full chart in a new browser window. And here is B.C. 's annotated chart of the CRB and the "old" CCI commodity indices from 1974-2009. Note the effects of the overweighting of energy. Click on the thumbnail to see the full chart in a new browser window. 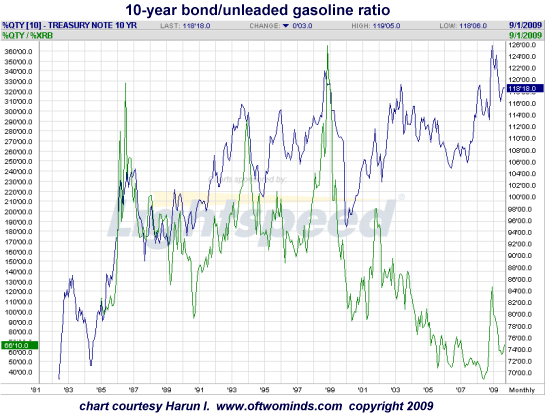 In analyzing these charts we must remember that the commodities are priced in U.S. dollars. That of course is what makes understanding commodity price fluctuations akin to a 3D chess game: if the dollar snubs the 97% bearish pundits who are calling for its demise and rises significantly, then each dollar buys more commodities, even if that commodity is rising when priced in gold or another currency. But if the dollar tanks as widely expected, then even commodities which were stable in value when priced in gold or other currencies would cost much more in dollars. Check that volume out on the weekly ... If I was looking for something conspicuous to mark a possible capitulation low on the dollar (like last year's low) it might be ramping volume. Thank you, Angry Saver, B.C. and David B. for your commentaries and charts.All of which remind us that attempting to "price" commodities or understand consumer prices without accounting for the dollar is a doomed enterprise. Put another way: the basis of stable consumer prices is a stable, sound currency. Speaking of which: here's an idea whose time has come: End the Fed by Ron Paul. 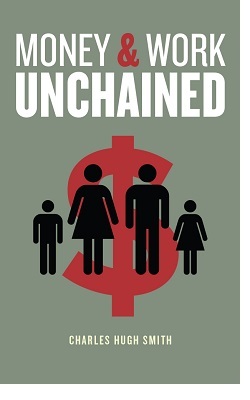 This book is currently #6 on amazon.com, so we can surmise that many other citizens are concluding it is indeed time to end the experiment of State manipulation of money supply, liquidity and interest rates, all of which have led to endless and endlessly destructive asset bubbles, inflation and financial fraud. Thank you, Kathy P. ($5), for your much-appreciated generous donation to this site. I am greatly honored by your support and readership. A little inflation is supposed to be "good." From the perspective of the wage earner and taxpayer, it's simply "theft by other means." Deflation is supposed to be horrible and awful, and a steady dose of inflation is supposed to be "good." So your cash gaining value is awful, and it's great when it is robbed by inflation. How "good" is that? 1. Politicians need to distribute swag to the electorate every two years. Their perspective is thus necessarily short-term as no politician dares care about what transpires a decade or two hence. As a result politicians must favor inflation, which enables them to borrow/print money and distribute it as swag to self-absorbed greedy voters now and then pay interest on the new debt with "cheaper" future dollars. 2. Voters possess the built-in human bias for present gain over future gain. "One in the hand is worth two in the (future) bush" is the default human response, and future insolvency is meaningless to those expecting and desiring swag in the present. Indeed, politicians have noted that those who demand sacrifice in the present to address a long-term crisis lose elections while those who distribute the most swag now while ignoring the gathering storm on the horizon win elections. 3. Inflation is thus "good" for politicians and the government as it enables paying off obligations assumed in the present with devalued future currency.But is it "good" for the voters who actually earn income? As Paul Volker recently observed (I paraphrase), is a policy which robs a third of your money every decade a worthy policy? For that is precisely what "low" inflation of 2.5-3% annually does: it reduces your dollars' values by a third every decade. Will the swag "given" to you (is it "given" when it's your own future earnings?) now in the form of government benefits and tax cuts add up to more than a third of your future earnings over a decade? Unlikely, to say the least. 4. So politicians exploit the human bias for short-term gain even as they rob the taxpayers via inflation over the long term. Inflation is tolerable as long as you're a wage earner and your income rises at the same rate as inflation. But income from labor (wages/salaries) have been flat to down since the early 70s for most Americans, and so inflation has only been "good" for those holding assets which have risen more or less in lockstep with inflation. For those whose earnings might rise nominally by 15% a decade while inflation robs 30% of their wages' purchasing power, then "a little inflation" is a long-term disaster. 5. The usual argument in favor of inflation is debt-based. That is, inflation is wonderful because it enable us to pay off our debts with future "cheaper" dollars. But if our incomes are being robbed by inflation, then is that "benefit" of inflation really so valuable? If I lose a third of my purchasing power in a decade does being able to pay down my mortgage with depreciated dollars offset my loss of purchasing power? No--unless my mortgage payment exceeds my income by a fair margin, which is essentially impossible. 6. Deflation is excellent for those with cash and earnings and awful for kleptocracy governments and those with overleveraged debt. The entire idea that "inflation is good" masks a perverse incentive: take on as much debt as you possibly can because interest will become "cheaper" to pay in the future (assuming yuor earnings keep up with inflation). If your earnings don't keep up with inflation, well, too bad. So as the purchasing power of its taxpayers' wages are stolen via inflation--truly "theft by other means"--then the government's ability to collect ever-larger sums of money via taxes is crimped. Unless, of course, the government can create asset bubbles via loose credit and unlimited liquidity which then generate huge capital gains for asset-owners which can then be taxed. 8. The entire "inflation is good" idea is a self-reinforcing noose. To enable distribution of swag to voters and special interests, the government/kleptocracy offloads the payment for the swag into the future, and by creating inflation then the government guarantees (or so it reckons) that it will be able to pay the interest on that money with "cheaper" money collected from taxpayers in the future. But as taxpayers find the purchasing power of their earnings declining (theft by other means) then they respond to the incentives presented by the government: borrow to the hilt and speculate in asset bubbles as the only way left to maintain purchasing power. This dependence by both goverment and citizenry on asset bubbles to maintain purchasing power leads to over-leverage and over-indebtedness which then leads inevitably to a collapse of asset values (which were based on exponential credit expansion) and the tax revenues which were dependent on a constant series of asset bubbles. Now the taxpayers find their assets decimated and their purchasing power diminished while government finds its tax revenue base has been decimated. Paying interest on all that debt while distributing unlimited swag was predicated on rising tax revenues. That plan has now been revealed as fantasy. Inflation is nothing but a "theft by other means" scheme which leads to impoverishment and insolvency. Thank you, Tony M. ($20), for your third stupendously generous donation to this site. I am greatly honored by your support and readership. Officially, 14.9 million Americans are unemployed. That number will double. The number of people who are unemployed is almost unimaginable: 15 million.According to the Bureau of Labor Statistic's August 2009 Employment Situation Report, 14.9 million persons are unemployed, 9.1 million are "working part time for economic reasons," and 2.3 million are "marginally attached to the labor force," i.e. they wanted a job but have not actively looked for a job in the past four weeks. We need to understand the dynamics behind the unemployment numbers. 1. Some unemployment is normal; people lose a job or quit and then find another one, usually within six months--at least in times of prosperity. So even in prosperity, 5 to 6 million people are "between jobs" and thus officially unemployed while they draw unemployment benefits. Thus at least 5 million of the 15 million currently unemployed are "baseline" unemployed, the normal shifting and adjusting of thousands of enterprises and 137 million workers (the size of the civilian workforce as of December 2008). So while the "official" estimate was 2 million people would lose their jobs due to recession, the actual number is already 10 million. At least 2.3 million have given up looking and 9 million more have had their hours slashed. Note to Ministry of Propaganda: you really need to align slightly with reality or you lose all credibility. 2. The BLS estimates the number of jobs created by the "birth" of new small businesses which it assumes are flying beneath its statistical radar and the number lost as these same small business close their doors. Uncannily, millions of these phantom jobs are statistically "created" every year by the BLS model, which of course was constructed on the basis of decades of endless prosperity. My esteemed blogger colleague Mish Shedlock has explained the Birth-Death Model extremely cogently. Even if you grant the BLS statisticians some slack, it is patently absurd to expect small business to create jobs in a deep recession at the same rate it (supposedly) creates them in prosperity. 3. Official unemployment does not differentiate between the long-term unemployed--those who have been looking for over a year with no luck--and the typical unemployed who find another job within six months. In "normal prosperity" then an uptick in unemployment is not too worrisome because people find another job within a year. But when the economy sheds jobs relentlessly, then people become long-term unemployed: they can't fnd a job this year, or next year, or the year after that. This is also called structural unemployment. What few are willing to accept is that the U.S. economy is entering a decades-long period of structural unemployment in which there will not be enough jobs for tens of millions of citizens. My January analysis remains conservative; given the end of the credit/debt bubble and other structural issues, it seems very likely that the U.S. economy might have about 100 million jobs in a few years--leaving some 35 to 40 million people without formal fulltime work or employer-paid benefits. Since we're already at 26.3 million unemployed/under-employed, losing 10 million more jobs is really not much of a stretch. That would leave 36 million people without fulltime work or any work at all and about 100 million still employed. 4. Since many professionals such as realtors, contractors, freelance designers, consultants, etc. are usually self-employed, then these millions of people may be reporting (in the "household employment survey") that they're employed but their income may be near-zero as work in these fields has dried up. In an economy based on exponential expansion of debt and ever-increasing velocity of borrowed money, the loss of this credit expansion and velocity is nothing short of catastrophic. I find the many fantasies about "new high-tech industries creating millions of jobs" to be especially tiresome because they are always generated by Standard-Issue Financial Pundits who don't even know what a Molecular Foundry even is, much less what goes on inside it--or by a venture capitalist touting why the company he just invested in is worth a gazillion dollars. The more you actually know about very high level technology, the less likely you are to spout nonsense about millions of jobs being created. For instance: nanotechnology. Well guess what, SIFP cheerleaders: we already have nanotechnology and it's called silicon wafer/chip production. With computer chip circuitry down to the sub .25 micron range, that's nanotechnology. How many jobs are being created in this industry? very few, as the machines which actually produce the nanotechnology are mostly automated. How about all that R&D (research and development) in biofuels? I was speaking to a biofuels researcher at Caltech (California Institute of Technology) ealier this year about his team's biofuels/bioengineering project, and he was extremely wary about the prospects of this technology being scaled up to a meaningful level, i.e. a technology which reliably produces, day after day after day, tens of millions of gallons of high-energy-density liquid fuels which can replace fossil-fuel based jet fuel, diesel and gasoline. The more you actually know about very high level technology, the less likely you are to spout nonsense about scaling up extremely finicky and unproven technologies. It doesn't take more than high school chemistry, biology and physics to understand 99% of the technical/biological limitations of "miracle" technologies. For instance, algae, like every other organism, requires some feedstock (food). It doesn't just reproduce with no inputs. And like every other organism, it can die if conditions sour. So gigantic ponds of algae producing biofuels sounds good until you actually try it and your algae mysteriously dies off. Sorting out the actual fuel from the gunk and sludge is a non-trivial task as well. James Howard Kunstler's recent post Original Sin neatly lays out the other structural erosion in the U.S. economy: the end-state of the Suburban Lifestyle. Much of the FIRE economy (finance, insurance and real estate) was based on the endless expansion of suburbs and exurbs. The dirty secret all along was that by 2005 there was no economy left in the USA beyond the suburban sprawl economy with its so-called "consumer" nexus -- largely devoted to the outfitting of suburbia. There were an estimated 129.4 million housing units in the United States in the first quarter 2008. Approximately 110.8 million housing units were occupied: 75.1 million by owners and 35.7 million by renters. Of the 2.1 million increase in total housing units, 1.1 million were occupied and 1.0 million were vacant units. Of the 1.0 million additional vacant units from last year, only 20.5 percent were for rent or for sale. The number of total vacant housing units, 18.6 million, was higher than the estimated number in first quarter 2007. Of these vacant housing units, 13.9 million were for year-round use and 4.7 million were for seasonal use. Approximately 4.1 million of the year-round vacant units were for rent, 2.3 million were for sale only, and the remaining 7.5 million units were vacant for a variety of other reasons. My original January analysis by job category remains pertinent. Given events since then and the coming meltdown/implosion of state and local governments as tax revenues plummet, these estimates seem optimistic. Let's look at each category and make a rough back-of-the-envelope estimate for how much paying work each category might support in, say, 18 to 24 months. Construction. While bridges being repaired will certainly support heavy-construction employment, the far larger categories of residential building and remodeling and commercial construction (office towers, malls, warehouses, etc.) are completely overbuilt for years to come. So let's guesstimate that there will be 50% less demand for construction and a job loss of 3.5 million in this category. Manufacturing. Unfortunately, a tremendous amount of manufacturing is dependent on construction (glass, appliances, steel, etc.) and transportation (rubber, steel, components, semiconductors, etc.) both of which are in freefalls. Exports are falling as fast as imports. Let's be charitable and only carve off 3.5 million jobs here, leaving 10 million intact. Retail. Does anyone doubt that fully 1/3 of all retail outlets are now surplus? We're talking about fulltime positions here; so cutting hours from everyone on the floor may actually save jobs (i.e. hours cut will not show up in the above statistics) but the equivalent fulltime positions (that is, 40 hours of paid work a week) may well have vanished. Let's guesstimate that 5 million retail positions will no longer be supported by sales/profits. Professional and Business Services. Legal and accounting services will suffer as businesses fold. Businesses will decide they need fewer contract workers, fewer consultants, fewer financial services and fewer software upgrades. Let's guesstimate that 2.5 million jobs will eventually be lost in this category. Education and Health Services. These have been the growth industries, along with financial services, during the bogus "prosperity" of the past eight years. Once millions of jobs are shed, then millions of dollars of health insurance are no longer paid by employers, which means healthcare providers will get squeezed along with every other category. Here is California, college enrollments are being capped as deficits soar; the inevitable next step is to leave jobs unfilled as people retire--one way or another, a reduction in total education employment. Let's guesstimate 1 million of these jobs get cut--perhaps not by layoffs but by retiring workers not being replaced. Leisure and hospitality. The sad fact is nobody needs to take a cruise or a vacation; both are the acme of discretionary expenditures. I would be shocked if the U.S. economy didn't shed 3.5 million jobs in this category. Government. Local government (cities, counties, states and agencies) has added 12% more employees in the past eight years of bogus debt-based "prosperity," and the freefall in tax revenues means those 12% of "new" government jobs will vanish--and that's the best-case scenario. Let's guess that a total of 2.5 million jobs will disappear as tax revenues plummet and then keep plummeting. 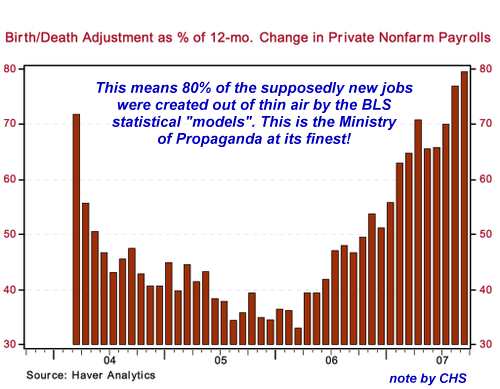 The total: 21.5 million jobs--3 times the BLS estimate of 6.7 million jobs lost to date. Very few have the stomach to consider the reality that perhaps 20+ million jobs are no longer supportable by private industry revenues and profits and the tax revenues which depend on those profits and jobs. 21.5 million jobs lost works out to about 15.6% unemployment--a full 10% lower than the 25% unemployment rate reached in the Great Depression. In other words, 21 million jobs lost is actually an optimistic guesstimate compared to what could transpire in the years ahead--a gradual evaporation of 30-35 million jobs. If Federal fiscal stimulus funds a couple million jobs--more likely retaining jobs in heavy construction and manufacturing that would otherwise be lost rather than adding jobs--then the total job loss might not be as severe until the "extra" Federal spending ends in 2010. Just off the top of my head, here are industries which are sure to be hard-hit: media, advertising, cruise ships, professional sports (how many people will be able to afford $45 tickets for seats plus $20 for parking and $35 for a few beers and hotdogs? ), spas, auto detailing, non-profits, pricey venues like museums which depend on wealthy donors (far fewer of those suddenly)--the list is long indeed. Even worse, the deeper issue--the End of Work in a resource-profligate and consumer-based economy--isn't even being addressed yet. Knowledgeable reader Matt S. recently recommended The End of Work by Jeremy Rifkin. 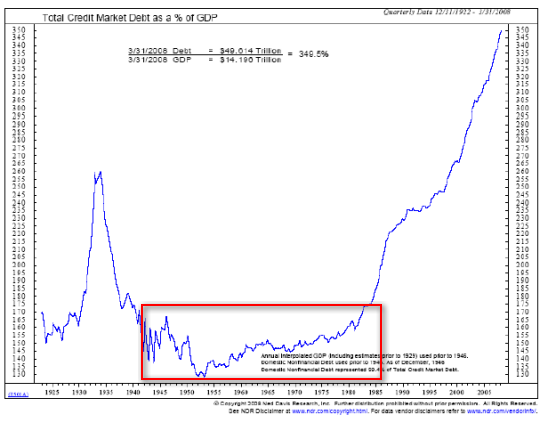 Rifkin's primary point is that the "full employment" of the bubble eras (dot-com asset bubble followed by credit-housing bubble) was a temporary aberration from the underlying trend caused solely by unsustainable credit-based (borrow and spend) consumerism. 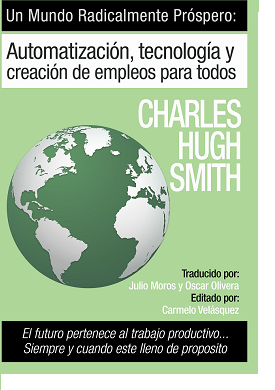 The long-term trend is: productivity is raised by the replacement of human labor (jobs) with automation/machines/software. As productivity rises, the number of jobs decreases. Rifkin points to the U.S. steel industry as an example. Since 1981, the industry has boosted production by about a third while reducing the number of jobs from 384,000 to 74,000. 1. The end of the 60-year long "build and outfit suburbia" economy. 2. The end of the 80-year long Keynesian experiment in boosting "growth" and employment with ever-higher deficits and exponential expansion of credit and debt. 3. The ongoing trend to replace high-cost human labor with automation, software and fundamental efficiencies and the global arbitrage of wages (offshoring, moving production to low-wage nations, etc.). So what happens when 40 million people don't have jobs and benefits? Well, we can act as the Ministry of Propaganda suggests and believe it will all work out somehow if only people borrow and spend more money, or we can adapt. We can keep extending unemployment benefits, essentially forever. This is the compassionate response to structural unemployment. As Bob Marley sang, "a hungry mob is an angry mob" and food riots might well be the result of leaving 30 million people without any income. As I have noted many times, unemployment and food stamps are "cheap" programs. The entire food stamp program which serves tens of millions of households costs about $30 billion-- less than 5% of the bloated Medicare system. For context, recall that "defense" and the GWOT (global war on terrorism), Social Security and the Medicare/Medicaid system all cost about $650 billion each. Compared to those numbers, $30-40 billion to feed people is modest indeed. It is especially cheap when compared to the obscene $11.6 trillion in Federal bailouts we have collectively ponied up. Some sort of cultural shift to job-sharing might be in order. Yes, I understand it's inefficient but there are social "efficiencies" to consider as well as financial ones. As I noted in End of Work, End of Affluence III: The Rise of Informal Businesses (December 10, 2008), the Third World model of tens of millions of people finding informal employment in non-formal businesses holds much promise for the U.S. unemployed. As someone who has been "marginally attached to the labor force" for decades (with occasional brief interruptions of formal employment), I can assure you that what I term hybrid work is entirely possible: some paid work, lots of unpaid work, and lots of "experiential capital" created and traded. All it requires is an entrepreneural mindset, an understanding that Capitalism requires Risking Capital and/or Labor to generate a Return (i.e. failure is part of the process, so don't let it get to you) and a very low-cost lifestyle. The stress level of a low-cost lifestyle is lower than that of a high-cost lifestyle.If happiness is more about "the pursuit of happiness" than consuming, then hybrid work holds the potential of being far more satisfying than formal fulltime work in Corporate America--especially if you can't find work in Corporate America. Thank you, Andrew M. ($25), for your exceedingly generous donation via U.S. mail to this site. I am greatly honored by your support and readership. Leverage is great on the way up and catastrophic on the way down. Astute reader Scott pointed out that comparing housing to gold on a cash basis missed real estate's key feature to the average homeowner: the leverage provided by a mortgage. (When Housing Is Priced in Gold September 23, 2009) That is indeed a critical advantage when housing is rising--and a freight train slamming equity on the way down. First: your article seems to presume that everyone buys homes in cash and never has a mortgage. Almost no one can do that. Most people have a mortgage, and therefore they have LEVERAGE (against the bank)—the homedebtor gets all the gain (or suffers all the loss, normally) of any house price change. So when I bought a house in 2002 and sold in 2007, did I lose money because the valuation went down in terms of gold? NO! When I bought a house for X and wrote a check for about .05X and paid in about another .10x and then sold it, I came out with a check for about .7X, a 360% gain. Did gold nearly quintuple? No, I think it about tripled. Could I have put X into gold and gotten .7X in gain? No, I only had .05X (and later another .10X) to put in, had I not bought a house. (And, I’d still have to live somewhere.) Would a bank have loaned my a full .95X so I could put it with my .05X and buy 1.0X of gold? NEVER!!!! The second problem with the topic of the article is that gold is a volatile commodity, NOT a measure of basic purchasing power. Is gold at the “right” price now, relative to something we all NEED, say, food or energy? Was it the right price in 1988? 2002? 2006? You only “make” money in gold if its price is rising RELATIVE to things you’ll someday need to buy. If it only tracks such prices, it’s just a store of value, not an investment. If it lags such prices, even if it is also rising, you are losing wealth. No one NEEDS to own a house, or gold. They do need food and energy. So if you put together a graph that takes into account the leverage of home loans (mitigated, perhaps by the tax and maintenance expense) and another graph or the same graph that takes into account prices of vital goods and services (not just the flawed/understated CPI) I would be truly enthralled. Oops--household equity has dropped to levels not seen since the mid-1970s.So the net result of the housing bubble on actual household wealth has been negative--unless you count the $5 trillion extracted in mortgage re-fi's and home equity lines of credit. And what did homeowners get of lasting value for that $5T? I don't have the answer to that, but this chart reveals that homeowners with negative equity ("underwater") are rising dramatically. Studies have supported the common-sense idea that people with negative equity walk away from their mortgages at a far higher rate than those with substantial equity. Indeed, the "cure rate" of those who fall behind in their mortgages and then get current again is an abysmal 3-6% for all mortgages--including prime. The red box highlights historic averages of total debt to GDP from the end of the Great Depression to the mid-1980s when the Reagan Era ushered in vast increases in deficit spending, financial "innovations" and increased leverage (the S&L debacle, etc.). As for gold being a volatile commodity: all commodities are volatile. There is no one trade, store of value or metric which will retain purchasing power in the face of fluctuating commodity, currency and asset prices. Housing has done no better or worse than gold, depending on the time-frame you select. 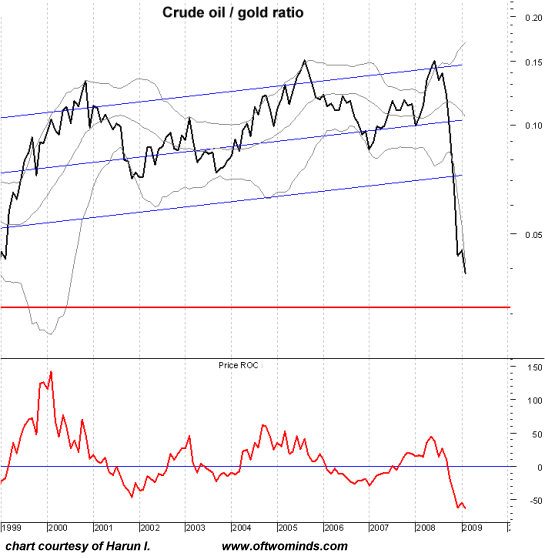 As gold rose in value this year and oil dropped, the ratio fell to levels not seen since the bottom in oil prices in the late 1990s. My point is simply that there is no asset--housing, gold, oil, dollars, wheat, etc.--which is guaranteed to retain purchasing power in a world of volatile assets, commodities and currencies. If there is one conclusion to be drawn from the above charts, it's that leverage is deadly once the bubble pops, and housing has been a disastrous "investment" for tens of millions of households who have seen their equity destroyed by a leveraged bet that "housing only goes up." True--until it doesn't. The same can be said of every asset. Gold bugs like to think that the dollar must be backed gold. In other words, they want South Africa, Australia and Russia to be the richest countries on Earth. Our current money system is much better. It allows any asset to back the currency. When money is "created" out of thin air by banks, and lent against collateral, that money is essentially backed by the collateral. The debtor must obtain dollars, or lose his collateral. Thus, we get a demand for the currency, all because of the millions of civil contracts like mortgages, commercial loans etc. that keep demand for the currency high. Amazing. Amazing that no one seems to understand this, yet, it's a perfect, and only explanation for why the dollar is not already waste paper. Like any system, it can be mismanaged, and by allowing lending in excess of the value of the collateral (accounting for risk) the system has broken down. But this could occur with a gold backed currency just as easily. Who is going to be doing the accounting on the gold vaults? On the amount of currency in circulation? That's right, the same corrupt politicians, regulators and bankers who caused the current mess. I close with a comment by Harun I. on the intrinsic difficulties of managing capital assets to retain purchasing power. "We have met the enemy, and he is us." Please read Hedge Funds and The Pareto Principle (February 19, 2007) for context. Pareto's curiosity was sparked by the fact that the greatest amount of wealth was in the smallest number of hands. His observation boiled down to: If you gave everyone in a society one dollar, eventually 80% of those dollars would wind up in the hands of 20%. And of course out of that 20%, 4% would hold 64% of the dollars. In this sense Nature's capitalism is always at work. Money moves from poor managers to strong managers. Strong managers put that money to use by investing in plant and capacity which puts people to work. Albeit imperfect and prone to greed, when left alone it works better than socialism. It has been my experience that nearly all of the people I know and have met have no idea what to do with their money. Doctors, lawyers, engineers, government officials and even money managers, all have no clue what to do with their money. Multi-million dollar lottery winners are broke in short order. People in entertainment routinely die broke. Bubbles come and go as they all chase the dream of something for almost nothing. It is not under-education or an inability to think critically which part people from their money, it is their uncontrolled emotions. Faced with purchasing a house which they know is unaffordable or choosing to rent they will not bother to run the comparison as long as it is their dream and "someone" told them they could. Had grumpy old Mr. Critical Thought been allowed to show up and run a spread sheet or put the numbers into Quicken they (the cold, emotionless reality of the numbers) would have irrefutably deprived them of their "dream". This drama plays out everyday at different levels across the spectrum of human psychology, the food you should not eat because you are morbidly obese, the years-old but never used exercise equipment in the garage, the spouse or partner who is abusive but you can't leave, the dress, shoes, house, boat, car you have to buy but cannot afford, the candidates we vote for because we like the way they part their hair. The inconsistencies, contradictions and convolutions are endless and mind-boggling to the point of madness to the observer. Thank you, Thomas F.F. ($20), for your delightfully generous donation to this site. I am greatly honored by your support and readership. The consensus is nearly universal that the dollar is doomed. Perhaps there are other forces at work beneath the surface. It seems a given now that the U.S. dollar is doomed to either slow depreciation or devaluation. Perhaps--but the consensus seems too easy. Yes, money supply and liquidity have exploded as the Fed and Treasury fight deflation, and yes, history suggests expanding the money supply debases the currency. Where it took less than $300 to buy an ounce of gold in 2001, it now costs about $1,000. Thus the dollar has lost 70% of its purchasing power when priced in gold. At the barbershop, the barber asked me if the dollar was at risk of failing. The dollar is not at risk of being wiped out, IT ALREADY HAS BEEN WIPED OUT, and the world is moving on. From 1789 to 1912, the dollar appreciated a full 11%. From 1912 to 2001, it has lost 95% of its value under the fractional reserve banking system of the Fed Reserve, massively overleveraged further since the inventive application of credit derivatives since the ‘90s. In 2001, a dollar index of $1.2 (as charted by the Dollar Index) existed and now it is at about .76. This recent drop results in a dollar loss greater than 95% from the 1912 value. The dollar HAS been destroyed in the proper historical perspective! A world-wide move underway, recognizing that the dollar is now unsustainable as a reserve currency, to a new form of reserve currency/currencies, will take some time, and, our dollar will remain as the reserve currency for a while as something new emerges. Regional currencies may evolve in the meantime: Yuan? AMERO? EURO? A worldwide, single, unified currency is too utopian for applicability. Regional currencies have yet to be proved sustainable either. We are in limbo with a sinking dollar. Geopolitical instability of increasing scope, including at least cultural and resource wars, are in the offing before anything gets settled. Remember the ‘100 years war’? Indeed, debased currencies and the evaporation of sound money are related to economic and social turmoil. Bankrupt regimes and empires have long attempted to solve the imbalance between their stupendous spending and declining tax revenues by reducing the silver or gold content of their coinage--in other words, "inflating their way to prosperity." It never worked. Bad money drove out good money, meaning people hoarded gold, silver and sound money and quickly passed off the depreciating "bad" money onto some other sucker. So let's ask cui bono: who benefits from the collapse of the dollar, and who would benefit from its appreciation? In general, those with debts to pay would benefit, as debt can be paid with "cheaper" (depreciated) dollars. Those holding the debt would not benefit, as their payments would continue to decline in purchasing power. So the question boils down to this: who holds the debt and assets? Pu another way: who would benefit from the dollar actually rising in value? The answer: the rentier-financial Elites. They're the ones collecting rent and interest payments, and a depreciating dollar is not in their interests at all. The falling dollar benefits those paying down debt (debt-serfs), not those to whom they pay rent and interest. Note that the last extreme of inequality was reached just before the Great Crash of 1929. The dynamic is this: as the rentier-financial Elite (what I call the Plutocracy) over-reaches , then their share of thenational income rises to extremes. 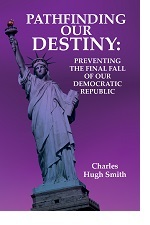 Their over-reach creates tremendous imbalances in the financial system, however, which lead to financial crisis. At that point, the State (central government) places some modest restrictions on the Plutocracy's ability to over-reach (overleverage, fraud, embezzlement, etc. ), and income inequality falls. Strangely enough, the mass media presents the Federal Reserve and the Treasury as "in charge" of the dollar's decline. Those agencies certainly control the strings of money supply and liquidity, but who sets their agenda? The bureaucrats? No, the bureaucrats (Bernanke et al.) are hired hands, following an agenda set by others-- those who control concentrations of wealth and thus political power. From this perspective, the entire outrageous bailout of the financials ector makes perfect sense. Question: who held most of the stock, bonds and other financial assets which would have been rendered worthless had the sector been allowed to collapse? It wasn't Joe Homeowner; some 80% of the financial assets of the nation are owned by the top few percent of households. So naturally the agenda sent down to the Congress and bureaucrats was simple: backstop the horrendous private losses with government (taxpayer) funds. The profits were private but the losses must be socialized/passed to the taxpayers. And so it was done, even as the citizenry pounded their "representatives" with emails running 300-to-1 against the gigantic bailout of the stupendously wealthy. In The Royal Scam, Anonymous Correspondent suggested the rentier-power Elite could shift their assets out of the dollar and then swoop back in after the devaluation to scoop up the assets of the U.S. for a pittance. That is a scenario worth pondering, to be sure, as it would solve the Federal Governemnt's massive debt at the same time. But just as a thought experiment, consider the alternative: that the power Elite sets the agenda of a rising dollar. Since the power Elite owns a staggeringly large amount of assets held in dollars, a rise in the dollar would increase their purchasing power as rents and interest are paid in dollars. A decline in the dollar would not serve their interests. So if a rentier-financial Elite does hold political influence, why have they allowed the dollar to plummet? Perhap their assets and income were growing faster than the dollar was declining. Now that their assets and income are no longer growing faster than the dollar is declining, the agenda is about to change: strengthen the dollar. Lastly, we might ask who else internationally might benefit from a rising dollar. How about the Chinese, Japanese and oil exporters who hold dollar-denominated debt? We might also note that exporting nations desperately want a stronger dollar which then weakens their own currencies, making their goods more competitive in the U.S. market. If we line up all those who benefit from a rising dollar, we find some reason to anticipate a reversal in the dollar's decline. Thank you, Daniel M. ($20), for your most generous donation to this site. I am greatly honored by your support and readership. Pricing U.S. homes in gold reveals that housing has fallen by two-thirds from its 2005 peak. Frequent contributor Harun I. suggested an interesting relative-value experiment: how has housing performed in the past 20 years when priced in gold? 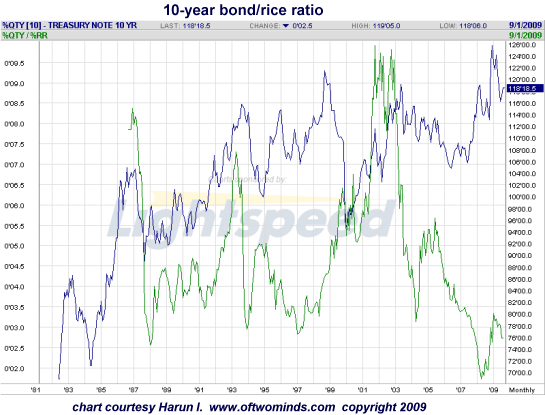 Oftwominds.com readers know that relative performance/purchasing power has long been a theme of Harun's and of this site. Considering all metrics of value in terms of purchasing power reveals much more insightful measures of value than nominal prices. For instance, measuring the cost of housing in terms of "how many loaves of bread would be needed to buy a house?" is a more accurate measure of purchasing power and valuation than measuring housing in terms of dollars, which have lost 25% of their value to inflation in the past decade and much more when compared to other currencies. Since gold is a universal metric of money, let's see how housing has done when priced in gold. Yes, I understand you can't live in gold or plant trees in gold, but the exercise isn't to suggest housing is "only" an investment like gold--the point is to seek an understanding of the relative peaks and valleys in housing valuation. In other words, is housing "cheap" now? There are various accepted metrics of approaching this question, for instance, comparing the equivalent costs of renting versus buying. Another is to ask if buying a house and renting it out at current market rates would yield a profit, and if so, how does that profit compare to other alternative investments? Priced in gold, housing has already fallen 2/3 from its 2005 peak when priced in gold. Harun's charts are large-format, so I have posted thumbnail versions below. Just click on the thumbnail to open the full-sized chart in a new browser window. The charts plot the well-known Case-Shiller Housing Composite as the proxy for the U.S. housing market. 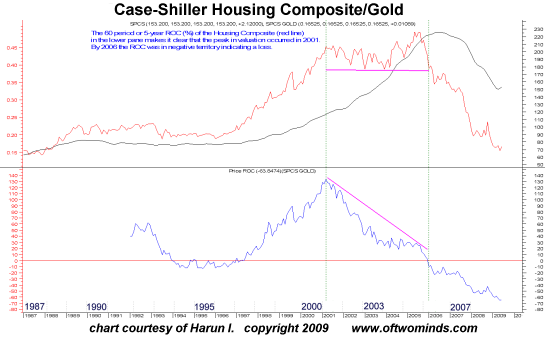 Harun offered these comments on the charts and the housing/gold ratio (relative-strength). The first chart is the S&P Case-Shiller House Price Composite (black line). The red line is an RS (relative-strength) of the composite to gold. Historical comparison suggests home prices are still overvalued. The red line indicates that homes are worth in gold what they were in the late 1980's while nominal prices remain elevated. Click on chart for a full-sized version in a new browser window. At the peak in 2005, the median home price equaled 490 ounces of gold. The present median price is worth about 160 ounces of gold, or roughly the same valuation as 1988. Nominal housing prices have returned to 2003 levels. 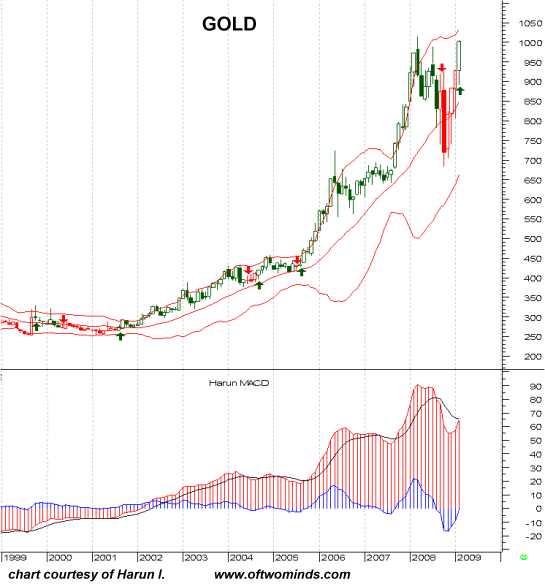 But when priced in gold, the 2003 valuation was 420 ounces of gold. Now that nominal prices have returned to that level today, the median house will only fetch 160 ounces of gold. But if nominal prices revert to pre-bubble valuations (1997-98), which is the typical course of popped asset bubbles, then we could see housing become even cheaper when priced in gold. That is, if gold continues rising and housing continues declining, then it is certainly possible that the median house price could fall to 100 ounces of gold--a mere 20% of its 2005 peak. 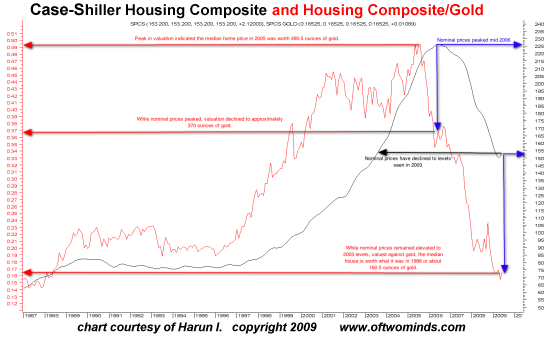 Harun's second chart plots the housing/gold ratio's rate-of-change. In 2001 the median house fetched 460 ounces of gold and the median price was about $115,000, a 4-to-1 ratio ounces of gold per dollar of house value. By the valuation peak in 2005 that ratio had fallen to 2.17-to-1. The boom period actually saw an overall loss in value. Stated another way the best time to sell your home and buy gold actually occurred in 2001; you would have received twice the gold which would have seen very handsome appreciation. The truth: the boom was over by the time everyone thought it had begun. Priced in gold, the median house bought 460 ounces of gold in 2001 and 490 ounces at the peak in 2005--a gain of 6%, considerably less than the nominal price in dollars. Had a homeowner eschewed the blandishments of the housing bubble in 2001 and sold his/her home for 460 ounces of gold and rented for eight years, he/she could now buy a home for 160 ounces of gold and have 300 ounces in hand. Here is a chart of the Case-Schiller Composite plotted in percentage points of rise or decline. If we looked only at this chart, we might reach the conclusion that housing has "bottomed" and that it's "cheap." But if we price housing in loaves of bread or gold, we might reach a completely different conclusion: priced in commodities or gold, housing may not have reached its nadir, and other stores of value might retain more purchasing power than housing. Should gold plummet, then of course housing would rise in relative performance even if it remained flatlined in nominal prices. If gold were about to fall dramatically, then this could be the relative valley in housing/gold valuations. But the more likely scenario remains a continuing decline in nominal housing prices back to pre-bubble valuations. In this case, even if gold remains flatlined at $1,000 an ounce, then it will take fewer ounces of gold to buy a house in the future. The point is to consider housing in relation to purchasing power/relative performance, not just in nominal dollar terms. Housing will always have value as shelter and land will always have value as productive dirt, but we must be skeptical of the constant hype that "a home is your best investment." For the past eight years, when priced in gold, that has been patently false. Thank you, Willard S. ($50), for your stupendously generous donation to this site. I am greatly honored by your support and readership. 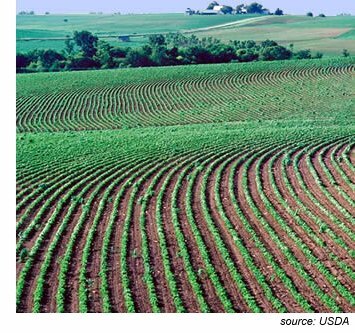 Global agriculture is fraught with an extraordinary concentration of vulnerabilities, some due to the control of cartels. I recently contended that much of household income flows to a handful of cartels How Much of Your Money Goes to Monopolies and Cartels?. The same can be said of the source of most of our food: global agriculture. I just did a quick analysis of the corporate take in my area of expertise: Farming. $111 goes to fertilizer. We have a choice of 2 companies. $65 goes to fuels. We have a choice of 4 companies. $9 goes to insurance. We have a choice of about 4. $8 goes to machinery. We have a choice of about 4. Monsanto and syngenta are getting scary in this field. They are the leaders in plant breeder rights and see the infinite profit potential in owning the bulk of the world's food genome. Scarier than Peak Oil in my opinion. If they are able to saturate the market with their crop varieties you can be sure there will be built in 'self destruct sequence' that means you MUST buy their seed or have a crop that reverts to weedy grass. This is the case with many hybrid vegetable varieties already. The seed they produce will not produce good marketable produce the following year ... it throws back to a highly variable plant of different sizes, grades and maturation times, making it difficult to manage and market. So $259 to $282 or 80% to 87% of costs of wheat production go to multinational companies! The other 13% to 20% goes to small service providers who could probably break their costs down in the same way. When you consider that chemicals and fertilizers use huge amounts of fuels to produce you can sense that the share of total money flowing in the agricultural sector that stays within the major corporations is very, very high indeed. Thank you, Bart, for a very enlightening peek into agricultural cartels. Let's consider a few of the issues which Bart's summary raises. 1. Efficiencies. Economies of scale favor large global enterprises, so the emergence of cartels is to some degree a reflection of "scaling up" production to lower costs. 2. Profits. As Marx observed, competition leads to consolidation: weaker competitors are muscled out or bought out and mature industries consolidate into a few hands. Competition is simply not profitable: monopoly generates the highest profits.Capitalism does not favor "free markets" as is widely assumed, but the destruction of free markets. Thus "monopoly capital" is the preferred goal of capitalism as it eliminates the risks of competition and maximizes the returns via price-fixing. Globally, various corporations have sold goods at prices lower than the cost of production to drive competitors out of business. Once the field is cleared, then prices jump. If a complete monopoly isn't possible, then a cartel will do; competition is reined in to the margins and profits fluctuate within "safe" boundaries. 3. Genome patents. Just as overly-broad software and digital patents end up stifling innovation, the wholesale patenting of plant genomes is threatening to limit seed stocks to a monopoly or tiny cartel of patent holders. 4. Dependence on oil/fossil fuels. While agriculture's dependence on fossil fuel feedstocks for fertilizers and oil for transport/production is well-known, what few consider is how Peak Oil could drive Peak Food. Without massive quantities of chemical fertilizers and pesticides and cheap liquid fuels for transport, how much would global crop yields fall? The extreme vulnerability of high-yield grains to disruptions in oil and the stranglehold on hybrid seed stocks is poorly appreciated. The irony is that the efficiencies which drive economies of scale also create long, inherently fragile global supply chains and various systems with low redundancies: that is, a high dependence on a few suppliers and transport lanes. Risk and return are intrinsically bound. If we move to lower risk with redundancies (backup systems, hedges, etc.) then costs rise and returns are lowered. 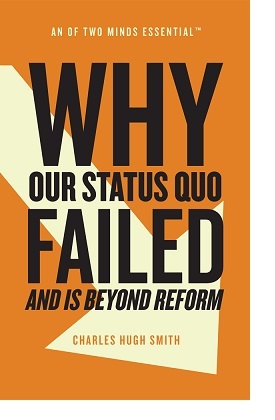 If we maximize returns with scale and ruthless efficiencies then we reduce redundancies to near-zero and thus heighten the system's vulerabilities to disruption. Global agriculture has become extraordinarily productive but at the "cost" of rising dependencies on a handful of suppliers and resources. Peak Food is not on many analysts' radars; maybe it should be. Thank you, Robert W. ($25), for your exceedingly generous donation to this site. I am greatly honored by your support and readership. There is no such thing as "absolute safety" in investing because every instrument or investment is "priced" in a currency, commodity or other instrument. Thus the only way to measure performance is in purchasing power or relative strength. Longtime contributor Harun I. provides a context for what constitutes "low-risk securities" by introducing us once again to the concept of relative strength/performance. 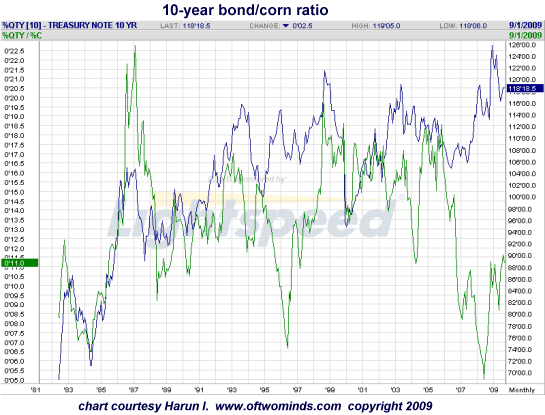 Harun has on several occasions shared charts which plot two investments as a ratio. This illustrates that every security or investment is "priced" in a currency or commodity or other instrument. For example: many analysts have noted that the Dow Jones Industrial Average (DJIA) has returned to its September 1999 level in nominal terms. The standard commentary notes "we've gone nowhere in 10 years." NT: My whole idea is to lower risk in society by developing a system that can resist human error, rather than one where human error rules. The first step is to make sure that no financial institution is too big to fail. Next, make sure governments don't favour big companies. Governments should also decrease the role of economists – they're no more reliable than astrologers, and they do more damage. Q: Now that you've painted such a rosy outlook, do you have any advice on how individuals can guard against losing 40 per cent of their money in this extremely risky world? NT: My advice is that instead of investing in medium-risk securities, you should put most of your money in very low-risk securities, and a little bit in high-risk securities. Then you might get a good black swan. Also, it's good to have more than one profession, in case your own profession goes out of style. A Wall Street trader who's also a belly dancer will do a lot better than a trader who winds up driving a taxi. Mr. Taleb's points of view are interesting. But I would like you to examine the results of his investment advice. "My advice is that instead of investing in medium-risk securities, you should put most of your money in very low-risk securities, and a little bit in high-risk securities." Sounds reasonable. So let's look at the performance of what the "world" considers low risk against some everyday staples. (See charts below). The US 10-Year Note lost value against everything noted here (Unleaded Gas, Corn, Rice, Cattle, Coffee). But that is not the complete story. In most cases, buyers of these bonds paid taxes in the interest earned and fees to brokers only to find that if they sold them today they would purchase much less than they did 10 years ago. 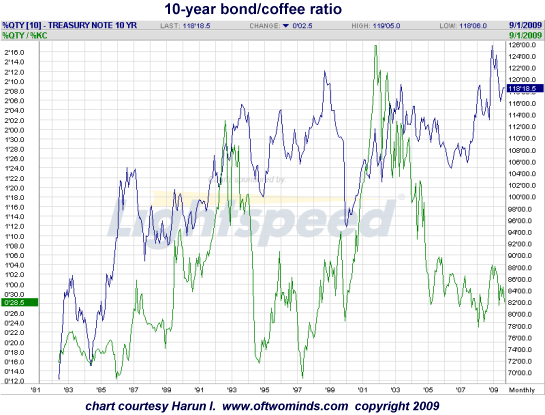 When the green line is rising 10-Year Notes are gaining in value. There is clearly a time to be in a given security and a time not to be. As a broad stroke strategy: to be in a particular instrument all the time is incomplete and exposes the investor to potentially large losses in purchasing power. I respect Mr. Taleb's work but anyone following his advice must understand relative value. They also must understand that if returns do not keep up with inflation, you may get back your principle but it will buy much less. This equates to a loss. There is no Lazy Man's Guide To Maintaining or Growing Purchasing Power. If the Fed is successful at causing an inflation rate of 3.5% purchasing power will be cut in half every 20 years. That might be okay if you are working and receiving raises but if you are retired, having your retirement check lose half of its purchasing power is devastating not only to the individual but to the society who must now "redistribute" wealth to support the individual. What I have been trying to help people to understand is that what is happening is a necessary feature of the current system. It is why Glass-Stegall had to be repealed (could any of the investment houses have applied to become commercial banks and therefore eligible for TARP funds with Glass-Stegall intact?). Without CDS's (credit default swaps) there was no way to expand credit at the rate necessary to avoid collapse. The argument that the $652 trillion in CDS's are offsetting seems ridiculous once one considers that someone was on the losing side and had to pony up a collective $326 trillion (this bad debt is still out there). Saving collapsed because it had to in order to feed the debt based economic machine. Throwing the losses onto the back of taxpayers is loathsome but necessary because in the wake of the collapse of all the debt producing machines, more debt must be produced and the federal government is the only one with a printing press. But as you say, this will have consequences. This fatal flaw is becoming widely known and it is about time we deal with it rather than papering it over, however politically untenable. Thank you, Harun, for an explanation of relative performance and purchasing power. 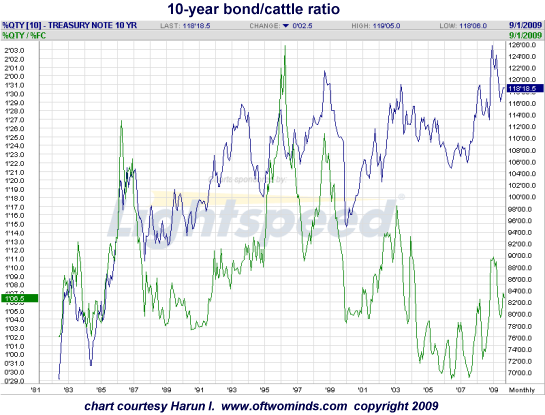 Harun has illustrated this by plotting ratios of the 10-year Treasury Bond against five basic commodities we buy as consumers: gasoline, corn, rice, cattle (beef) and coffee. Relative to these commodites, the bond has lost value. The most striking relative strength ratio is between the Dow and gold. At the stock market's peak in early 2000, it took about 40 ounces of gold to buy one "share" (11,400) of the DJIA. Now it only takes less than 10 ounces of gold to buy a "share" of the Dow (9,800). Priced in gold, the Dow has lost 3/4 of its value in early 2000. The investor who sold the Dow at the top and bought gold has gained purchasing power in terms of commodities and all fiat currencies. The investor who held the Dow has lost purchasing power. So much for "buy and hold" and "stocks always rise in the long term." I think 10 years qualifies as "the long term" and that has been catastrophically untrue for investors who bought U.S. stocks in 2000 and held. Thank you, Don E. ($15), for your stupendous generosity in monthly donations to this site. I am greatly honored by your support and readership. Correspondent Brad Lemley sees plenty of ways to "opt out" of enriching the cartels which dominate consumerist America. In How Much of Your Money Goes to Monopolies and Cartels? I suggested that the majority of household income flows to corporate cartels. Correspondent Brad Lemley points out that with some modest healthy effort, we can "opt out" of enriching cartels. He writes: "Charles, I think you are a little too pessimistic in this piece - there are more options out there than you let on. So allow me to weigh in." Brad responded to each of my ten points; I have italicized the original entry and placed Brad's responses in plain text. How Much of Your Money Goes to Monopolies and Cartels? In a supposedly competitive free market economy, why does most of our money flow through or to a handful of firms? Since I've been writing about concentrations of capital and cartels in Survival+, I asked myself: how much of our household spending flows through and to essentially non-competitive cartels or monopolies? The answer: most of it. 1. Mortgage. Most mortgages are processed and serviced by a mere handful of big players, so regardless of who owns your mortgage now, the mortgage/banking cartel is more than likely collecting a nice piece of it, and a chunk of the origination fees as well. I had no bank mortgage for my first home, which I built myself. No, I did not have the cash in hand. But my parents at the time had about $120,000 in investments (not an outrageous amount by any means). We had a nice, friendly, adult-to-adult talk, and came up with a mortgage deal in which they lent my wife and me $60,000 in a 15-year, 8 percent mortgage. The rate was smack between the then-CD rate of 6 percent, and the then-mortgage rate of 10 percent. We paid it off in seven years. My father loved it; he always said it was his best-performing investment and he got satisfaction from helping us. I loved it, because it was cheaper than a bank, and I got the satisfaction of helping my folks (and freezing out the banks). There are trillions in personal bank accounts collecting zilch (or in mutual funds, losing money daily). Many of the people who own those trillions have trustworthy, responsible family and friends who are borrowing from banks at usurious rates. This is insane. We have all been hypnotized to believe that lending between private citizens who know and trust each other is a bad idea. It is a great idea. 2. Utilities. How much choice do you have in providers of electricity and natural gas? Zilch. So your money goes to a monopoly. Lots of folks where I used to live in Maine, myself included, heated with wood from their own lot, some cooked with it as well. 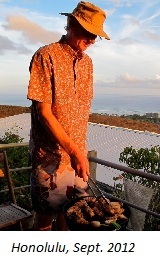 Others went off the grid via photovoltaic and solar hot-water panels. 3. Telecom/phones/Internet. Your landline (if any), Internet and mobile services are divvied up amongst a handful of major providers. In the case of cable Internet service like ours, we pay a virtual monopoly: Comcast. Given the minor differences in service and costs (despite all the sham "deals" hyped constantly), the service from tweedledum and tweedledee is essentially indistinguishable. Mein Gott in Himmel, cancel cable! Cancel the land line! All anybody needs is an internet connection and maybe a cell phone. Why anybody would talk long distance on a landline for x cents per minute, when you can have a superduper, Jetsons-like videophone experience for no extra cost via Skype is beyond me. 4. Grocery shopping. A handful of corporations dominate the supermarket business, a handful of businesses dominate food distribution, a handful dominate the market for bulk grain and commodities like sugar, and a handful of global food giants manufacture most of the packaged food in the supermarkets. Unless you shop at small ethnic markets, then virtually all your grocery money goes to a few cartels. And even the small ethnic markets buy from distributors--and the grains are still controlled from seed to flour by a cartel. Grow your own. Buy from farmer's markets (there are twice as many now as there were 10 years ago). We get at least 75 percent of what we eat from these two sources. It is not difficult, unless you want to eat the crap they sell at supermarkets and die young. 5. Restaurants/fast-food. Yes, you might take out from the local eatery or frequent the local bistro, but a huge pecentage of meals-away-from-home are served by a handful of firms. Colonel, meet Ronald. Never eat at chains. Not difficult. The food is disgusting. 6. Media/Entertainment. Have you ever read the credits on all those wonderful art films from Europe? Gee, why is Canal+, the French media giant, listed on virtually every one? That "hometown newspaper"? It's owned by a media chain. The media and entertainment industries are dominated by a handful of global corporations, so whatever money you spend on media and entertainment flows to a cartel. Between library books and the internet, this base is covered. Further, how about "entertaining" yourself by growing a garden, fixing up your house, biking around town, sewing, building furniture, fishing, hunting, playing cards, learning and playing a musical instrument, and essentially emulating the way happy, healthy, productive, normal people lived on this earth for thousands of years before 24/7 passive entertainment began turning everyone into a fat, stupid consumer? 7. Auto and auto loans. I've never bought a new car or had an auto/truck loan, but most buyers go through the dealers for financing, and so a handful of global auto manufacturers also handle the majority of auto financing. So buy used with saved cash! Or bike! An interesting, recent technological development is "electric assist" hybrid bikes, such as the Giant Twist Freedom. Not cheap, but these are so effortless that they "Europeanize" sprawling American cities, making an 8-mile bike ride as easy as a 2-miler used to be. Cost for the electricity to operate them is about a half cent per mile. I try not to buy much of this crap. There are handcrafted version of most of it - make it yourself, buy it at a craft fair, or by a "vintage" version from a flea market. 9. "Healthcare" a.k.a. sickcare spending. Of course none of your money goes directly to providers, except perhaps dental work and eyecare. The big bucks flow through a handful of HMOs or insurers to a handful of hospital chains, and the vast majority of all those funny little pills you get by the boatload every month are manufactured and marketed by a handful of global pharmaceutical giants. I am 54 years old. I took an antibiotic for two weeks when I was 28 years old to cure a raging infection in my hand that was getting worse by the day. Aside from that, I have not taken a single pharm as an adult (and not many that I can recall as a kid). I eat right, exercise hard every day and get sun on my skin for vitamin D. No pill has the versatility of a healthy immune system, the end product of two million years of evolution that permit it to survive and thrive with basic care. I concede that I was lucky genetically, and that illness does befall some people despite their best efforts at maximizing health. But whether ou have good or bad genes, you can improve your odds by working at being healthy every day. 10. Local municipal education and other services. Property taxes (at over $10,000 a year, these constitute a huge chunk of our household expenses) flow to a monopoly called "local government," and do you get a choice about the schools we're paying for? Does your district offer charter schools and real choice in education? Is the municipal trash service in competition with private providers? (If so, then Waste Management dominates the private trash-service market, so you still up paying a monopoly or cartel). We had a good, local public school that I never begrudged - served our son well, more than worth the property taxes. We have the option of no trash service, and haul our meager garbage and copious recyclables to the dump. Thank you, Brad. I heartily concur that there are relatively straightforward ways to opt out of feeding the cartels our money. Thank you, Robert B. ($15), for your very generous donation to this site. I am greatly honored by your support and readership.